Gala RFC is proudly marching ahead with a new initiative, in defiance of the misery of relegation from the BT Premiership. 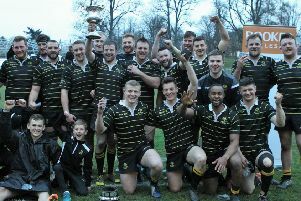 The Netherdale club was finally condemned to the drop on Saturday after a home defeat to Boroughmuir, having played in the top flight since 2011 and been runners-up in 2013-14. However, the club has announced the creation of a new rugby academy, having spent over a year working with partners to secure necessary funding. Long-term funding is now being provided by sportscotland over a four-year period, after which the club itself will assume resume full responsibility. The Gala Rugby Youth Academy, managed by the club’s youth development officer, Gregor Hunter, is a development programme intended to maximise the players’ rugby ability through skill development, strength and conditioning training, tactical analysis, nutrition advice, mental skills and life balance advice. Selected will be players aged 14-17 who have shown long-term promise on the rugby field but also demonstrate admirable behavioural skills such as commitment, self-reliance, discipline and work ethic that will allow them to thrive within its environment. Last Saturday had been a “desperately disappointing day” for Gala, said Mr Low, and not the reward for all the time and effort put in by everyone connected to Gala rugby – to whom he was extremely grateful. “We still have the BT Cup, the Booker Border League and the King Of The Sevens to play for this season before we regroup and fight to get back into the Premiership at the first time of asking,” he added. “It is very apparent that, to provide a sustainable club, we have to produce our own to the highest standard.